Oorah Gaming is a product line of of our parent company ONeil Online. All of our hardware and software is owned by ONeil Online and maintained by ONeil Online technical staff. 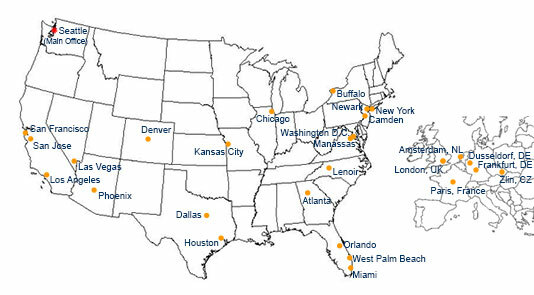 ONeilOnline top-tier data centers are located accross the United States and Europe to ensure the best response and ping times. Our network is fully redundant, load balanced, core network and backbone connectivity is unsurpassed in its efficiency and performance. This unique combination provides a superior network infrastructure with an unmatched quality of service. Thousands of clients around the globe choose ONeilOnline for the superior reliability our world-class data centers provide, with unparalleled security, network availability, capacity, processing power and operations management. With your IT infrastructure safe in our data centers, you can focus on cutting operational costs and on managing your core business’ success, not its servers. All of ONeilOnline datacenters are manned 24 hours a day, 7 days a week, 365 days a year. All of ONeilOnline datacenters are Tier IV SSAE 16 SOC 2 certified. All of OneilOnline's hardware and software is owned and maintained by our technical staff. Our servers are built using only Supermirco motherboards and brand name hardware components. We do not introduce new hardware unless it has been rigorously tested and pushed to its limits by our quality assurance team. Only after this testing process does the hardware get approval and certified for use in a production environment. We want to make sure our customers get quality, reliable hardware to minimize downtime. ONeilOnline maintains a highly scalable and redundant network with more than 1000+ Gigabit per second network capacity. Diverse paths from each of our datacenters provide for industry-leading quality fiber optic connectivity through such providers as Internap, Level3, Qwest, Abovenet, and Cogent. Overall design to sustain one or more worst-case failures with no critical impact on services. Multiple layers of surveillance and access control to protect against physical intrusion. Multiple active power distribution paths, including redundant components. Multiple, diverse power feeds from independent substations. Multi-megawatt diesel generator backup power. Our Seattle & Los Angeles datacenters have the best peering for Asian networks. Our Dallas datacenter has the best peering for Game Servers. Our Miami datacenter has the best peering for the Caribbean and South American networks. Our Frankfurt datacenter has the best peering for Europe networks. Our Amsterdam datacenter has the best peering for the United Kingdom and Eastern US networks. Our Zlin datacenter has the best peering for Eastern Europe and the Middle East networks.